Electricity consumers on the Prepaid Services commonly known as Yaka are already feeling the pinch of the new tariffs. Implementation of the 2017 Base tariff in prepaid services (Yaka) started on 1st January 2017. 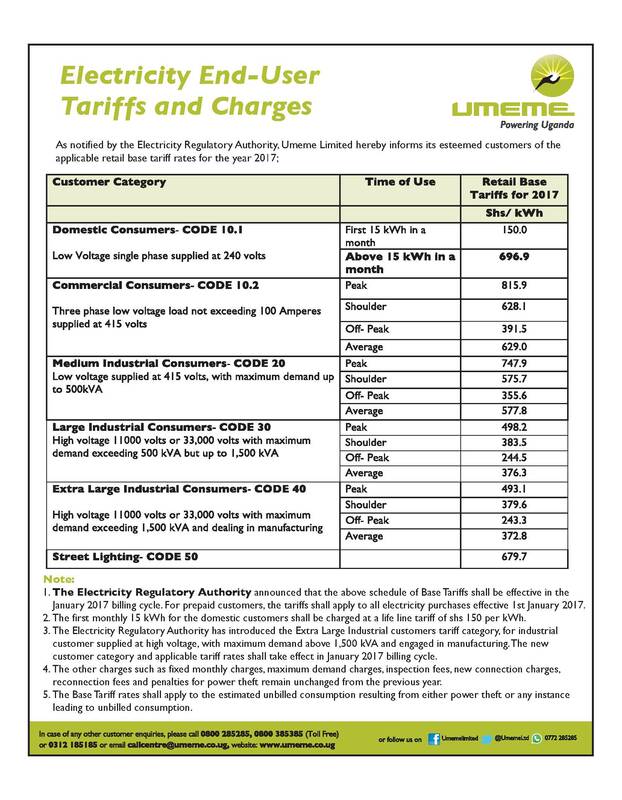 Late December 2016, the Electricity Regulatory Authority (ERA) in exercise of their mandate, approved the 2017 Base Tariff structure which puts the domestic cost of the first 15 lifeline Units at UGX 150/= each as has been in the past, and the extra units cost has been revised upwards from UGX 623.6/= to UGX 696.9/= each. A new category of Extra Industrial has been introduced and it caters for industrial set ups with maximum demand exceeding 1500KVA and strictly dealing in Manufacturing. Implementation Post Paid Services shall be on 8th January 2017, after the closure of December 2016 Billing cycle. Commercial consumers will pay 815.9 at the peak, 628.1 at shoulder, 391.5 at off-peak and 629.0 at average.